I read this book once as a teenager, I think it might have been written in the 1970s but could be late 1960s or early 1980s. The protagonist is left to die hideously by enemies. He is paralysed and left on some planet (I don't believe it was earth) in the habitat of some kind of crablike creature, which injects him with its young, and periodically returns to force nutrient and a paralytic agent down his throat, as the larvae grows inside him. He is rescued, and his body rebuilt to some kind of superhuman abilities, but he is traumatised and bent on indiscriminate revenge for his suffering. He proves hard to defeat. He is eventually defeated by trickery, when he is shown (or demands to see) something by some kind of video link or remote TV/monitor - perhaps he is told that people he wants revenge on, are held captive for him, I can't be sure. I think maybe he takes hostages or makes a severe threat, and his demands relate to the people he wants revenge on. But he can't be physically reached, so what can be done? They set up a video feed, to negotiate, or more likely, to purportedly show him they have what (or who) he wants, and he looks to see. When he looks at the video stream, it's actually an image of the crablike creature. The shock of repressed memories flooding back, renders him re-traumatised and perhaps catatonic, and defeats him. Crabs and arachnids share a good deal of legs, so I'm going to plagiarise my own answer to Little-known sci-fi story read in 1976 (Proteus? ): main character is caught by a giant orange spider thing which lays eggs in him and keeps him alive. Colonel Porter, officer of the Space Corps, has been abandoned for 5 years on the planet Conar, inhabited by the Drill population. 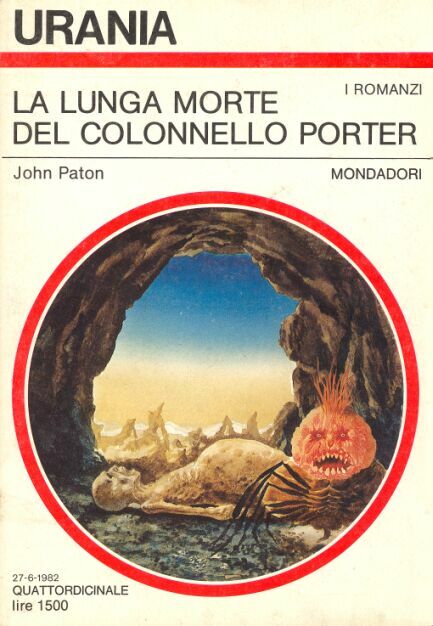 When a war breaks out on the planet, the colonel is sacrificed by the Drill priests, who abandon him in a cavern infested by the Testarossa, arachnoid beings, who will use his belly to lay and incubate their eggs. Due to the injection of paralyzing substances, Colonel Porter finds himself being a passive spectator of the sexual rituals that the Testarossa perform on his body. After a year spent in this terrifying condition, kept alive thanks to a nauseating substance that is directly injected into his throat by the Testarossa, he is rescued by some members of the Space Corps. His body is completely rotten and useless, but his brain, still fully functional, is removed and kept alive in a special structure. To avoid the damage caused by the absence of external stimuli, Colonel Porter's brain is constantly kept under the effect of sedatives, which will not allow him to conceive the condition in which he finds himself. When it is discovered that the Drill possess the secrets of telophoresis, ie the ability of teleportation , there is a need to bring back to life Colonel Porter, the only man able to translate the writing Drill, now completely extinct due to a civil war. A team of doctors and scientists manages to connect the colonel's brain with an artificial body with human features, but with clearly enhanced physical abilities. After having touched the madness in the cave of the Testarossa, Colonel Porter refuses to return to Conar and flees from the hospital where his resurrection had taken place. Victim of a precarious psychic equilibrium, the fugitive will have no qualms about killing all those who hinder his freedom. General McShane, assisted by the team of doctors, will try by all means to capture Porter and bring him back to Conar, but this will prove to be a very difficult test, given the great resources of the new body of the colonel. Note that "Testarossa" is kept as is from the Italian page, but I'm guessing the English original name for the creatures was something along the lines of "Red head".